iFi nano iDSD BL review | What Hi-Fi? iFi (pronounced as Eliza Doolittle might say “hi-fi”) isn’t alone on its mission to improve laptop sound for just a few pounds. The Cyrus soundKey (£100), Meridian Explorer 2 (£130), DragonFly Black (£90) and Red (£170) and numerous others have already set out along this path. But what’s less common is the will to extend that ambition to smartphone sound too. The Oppo HA-2 SE (£290) and Chord Mojo (£400) are designed to service both devices, and iFi’s portable (battery-powered, pocket-sized) iPhone- and Android-compatible nano iDSD BL (‘Black Label’) has followed suit. The nano’s Burr-Brown True Native DAC can handle PCM files all the way up to 32bit/384kHz (arguably more than you need), as well as DXD and DSD256 formats. It also supports MQA, thus extending playback to physical MQA files and Tidal Masters. iFi claims the iDSD has ten times the power output of an iPhone 6 and can comfortably drive a wide range of headphones, from smartphone-bundled buds to serious, more demanding over-ear cans (up to 600ohm). Alongside a ‘Direct’ 3.5mm headphone output, the ‘iEMatch’ output attempts to compensate for the extra sensitivity of in-ears. The 3.5mm line-level output at the unit’s rear is for connecting to an amplifier or pair of active speakers. The USB type-A port makes it easy to connect to Android and iOS smartphones, and doubles up as a charger when the 10-hour battery life runs dry. A switch offers a choice of two DAC filter options: 'Listen' (a minimum-phase Bezier filter that iFi suggests sounds better) and 'Measure' (a linear-phase Transient Aligned filter, said to perform better in measurement tests). We hook up our MacBook Air and find the iFi’s pleasant, neutral tonality and wholesome presentation easy to enjoy. Its firm holding of the tonal middle ground ensures our listening sessions are never ended by edginess or lethargy to the sound. A clean openness, filled with clarity and detail, has us soaking up our favourite playlists for hours on end. Perfume Genius’ Valley inspires head movement from the get-go with its giddy strumming, and the iFi’s rendition gets across the full weight of the track’s strokes of strings and flicks of keys. And they all have room to stretch out either side of the plaintive vocal. We try 24bit and DSD files, Tidal Masters (MQA) and Spotify streams, and the iFi proves more than transparent enough to flag the differences in quality. The LED flashes different colours depending on the file type and resolution being played: with DSD256, for example, it glows blue; play DSD 64/128 and it goes cyan. MQA turns the LED magenta. 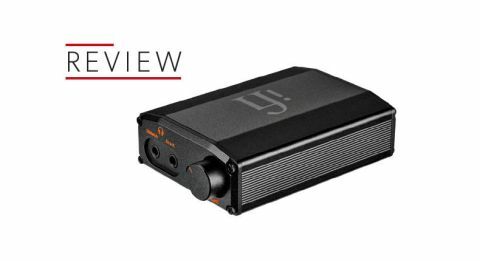 Compared to the presentation of the Audioquest DragonFly Red, our long-time favourite DAC around the £200 mark, it’s like upgrading from Economy to First Class – with the iFi, you get more elbow- and leg-room. That lends a hand to dense compositions like Jane’s Addiction’s Been Caught Stealing, as the iFi keeps the cacophony of electrics coherent and communicative. The DragonFly is the more skilled and precise showman, though, showing greater dynamic subtlety, punch and rhythmic flair. The drum streak that runs through Joy Division’s Atmosphere is more rousing, and its conversation with the cymbal taps and accompanying instrumentals is closer-knit. We try both the iPhone 7 Plus and LG G6 and Christine And The Queens’ Tilted takes on greater shape than it does through the smartphones’ outputs, thanks to a lift in bass presence, weight and clarity. Suddenly, the attention stolen by the vocal is also drawn to the song’s wavering electronics. If only it brought more timing precision and dynamic subtlety with it, the iFi would be getting on for ideal. While iFi’s latest effort may not tread the line between features and performance as confidently as some, there’s no arguing it’s a competitively priced, versatile and portable device that could be of great service to you and your digital devices.